Please don't contact me about how to get hold of this serial on video. I can't help. I have actually spoken with people who think this third FLASH GORDON serial is the best but to me it is the worst. For reasons lost in the mists of time, Universal replaced three of the original cast, Richard Alexander as Barin; Priscilla Lawson as Aura and Jean Rogers as Dale with three performers who are barely adequate. (Jean Rogers was under contract to Twentieth Century-Fox and unavailable.) In addition, the actors who play Barin, Roka and Ronal, all with pencil thin Ronald Coleman mustaches, look almost identical to me. My main criticism of this third adventure, however, is the very dullness of its plot, and the way the new footage is padded with stock footage not only from the previous FLASH GORDON serials, but also from the German silent film THE WHITE HELL OF PITZ PALU (1929) of mountain climbing and avalanches. In addition, every time a cunning plot twist is called for, it is always the same one, namely entering Ming's palace via the same badly guarded underground caves and exchanging clothes with Ming's guards (who luckily wear visored helmets) so our heroes can pass freely through Ming's corridors without being recognized. The dialog, which seemed charmingly naive in the two previous serials, is downright dumb in this one. We see Captain Torch releasing bombs, we see the bombs explode, yet Flash feels compelled to tell Dale, Barin and Roka, "They're trying to bomb us." It's hard to believe even 1940 audiences didn't laugh at this howler. Even the names of the science fictional devices are more generic this time around: disappearing device, contrafreeze solution, fire chemical. Sadly, the same slapdash postproduction of the first FLASH GORDON again is evident here in the occasional dubbing of what is meant to be the voice of one of the leads by someone who doesn't sound anything like him. Even within the same episode identical footage is shown of underground caverns for both the Rock People and the caves beneath Ming's palace. The stunt men replacing Buster Crabbe and the other actors are too obvious in too many sequences. Another drawback of this serial is that Ming is hardly in it and there is no subsidiary villain sufficiently menacing to take his place. Even when Ming has some screen time, the writers give him virtually nothing to do or memorable to say. His plots are so easily overcome, he is hardly threatening at all. Finally, the Rock People are not nearly as creepy and menacing as the Clay People from the previous serial, nor do they or the Frigians have anything much to do with the plot. For a change, Flash spends more time unconscious than Dale, who gets to flounce and pout and scream as usual. The entire female cast, Aura, Dale and Sonja, are basically just window dressing and have relatively little screen time and only peripheral involvement in the plot. 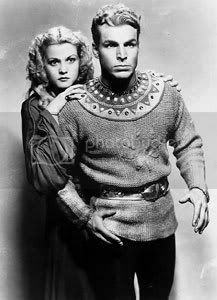 Buster Crabbe, in an interview in FILMFAX #79, also was critical of this last FLASH GORDON serial: "I didn't like the final FLASH GORDON serial. We used a lot of scenes that we'd done before, the uniforms were the same, the scenery was the same. Universal had a library full of old clips: Flash running from here to there, Ming going from one palace to another, exterior shots of flying rocket ships and milling crowds. It saved a lot of production time, but I thought it was a poor product that was nothing more than a doctored-up script from earlier days." Crabbe also regretted the many cast changes: "Flash didn't seem much like Flash anymore, surrounded by strangers, cheated out of original scenes, and deviating from Alex Raymond's original concepts. Being a perfectionist, I regretted that we couldn't remain true to either the creator's intentions or the prototype series that had been so successful. I guess my instincts were borne out, because that was the last FLASH GORDON movie made, not what Universal would call successful at the box office." I do find the opening recap of the previous chapter to be enjoyable. It is this serial's slanted text crawl that George Lucas copied for STAR WARS. However, I prefer the "spaceograph" comic strip recap from my favorite, FLASH GORDON'S TRIP TO MARS. One thing strikes me seeing this serial in 1997: the principle of "topping yourself" - of trying to meet audience's rising expectations - did not seem to operate, because it's clear no attempt has been made to include bigger and better stunts and effects. If this particular serial wasn't such an all around poor effort, I could almost admire Universal for that because it is my belief this is what is ruining films today: more stunts, more car crashes, more money in the budget for razzle dazzle, but less content, less to chew on and think about. As with the previous FLASH GORDON serials, this one gets off to a fast start and has non-stop action. Via stock footage and voice over, we learn a fatal plague has been ravaging Earth which leaves a purple spot on the forehead of the victims. As occurred previously, in FLASH GORDON'S TRIP TO MARS, all the world's scientists have gathered together but cannot agree on anything. They receive a report from Dr. Zarkov, circling the Earth with Flash and Dale in his rocketship, that the source of the plague is "electrified dust" which is being dropped out of a ship Zarkov recognizes as originating from Mongo. The Mongo spaceship and Zarkov's craft engage in a battle; Flash sends Zarkov's ship into a dive to fool the other vessel, which sets course for Mongo, with Zarkov's ship following discreetly behind. Flash and company decide to go to Mongo to solicit the help of Prince Barin, who lives in Arboria. Through dialogue used as a voice over (this seems surprisingly contemporary compared to the diagonal wipes and other old fashioned, if charming, editing techniques), we learn Barin has married Aura, Ming's daughter, and lives in Arboria, an idyllic forest kingdom. Barin and his soldiers are dressed like Robin Hood. Flash dons the local Ruritanian uniform and discovers he is just in time for a banquet to be held for Queen Fria of Frigia, another enemy of Ming. At the banquet Flash is presented to Fria and her aide and counselor, Count Korro, while Dale looks on jealously. Dale and Zarkov are not introduced. Meanwhile, back in Ming's palace, he is being amused by a dancing girl with long Freddie Kreuger nails. His pilots report the destruction of Zarkov's ship. His scientist reports an improvement in the death dust. Instead of killing everyone, now it will kill only those intelligent enough to oppose Ming. A test is scheduled for that evening. Queen Fria tells Barin and his guests that Ming has captured her General Lupi. Flash proposes he and Zarkov destroy Ming's power rooms, while the Queen's men rescue the general. They decide to go disguised as Frigians so that, if things go wrong, Ming will make no reprisals against Arboria. He can't make reprisals against Frigia because only the Frigians have the secret of surviving in their cold climate. Captain Sudan, the commander of Ming's Palace Guards, is loyal to Barin and sends word that General Lupi is to be executed that evening; the rescuers set off immediately. Ronal (one of Barin's men) and Korro permit themselves to be arrested by Ming's guards, setting off an alarm which interrupts the death dust test, just as General Lupi is about to face death. Using a remote control, Sudan opens the gate to the secret tunnel entrance to the palace, allowing Flash's party to gain entry. Ming orders Ronal and Korro into the glass chamber along with General Lupi for the death dust experiment, but just as the scientist is about to release the lethal dust, Flash and party arrive, destroying the death dust controls with a ray gun. Zarkov, meanwhile, has stayed behind to blow up Ming's lab, to prevent further dissemination of the death dust to Earth. Flash sends Korro and Lupi back to Zarkov's ship. A fight breaks out between Ming's guards and the rescue party, during which the glass death dust chamber is destroyed. Ming sets off to release death dust and kill everyone. The fighting continues, as Flash and an opponent fall into a deep pit in this chapter's cliffhanger. Flash catches himself on a handy bar, as he hurtles down the pit. Zarkov lowers a chain and hauls Flash to safety. The entire rescue party escapes to Zarkov's rocket ship but not before Ronal overhears Ming offer one hundred thousand mingolds for the capture of Flash and Zarkov alive. Ming speculates the Earth men were disguised as Frigians because they have made a pact with Queen Fria to mine Polarite, the only antidote to Ming's death dust. En route back to Arboria, Zarkov's rocketship is pursued by a fleet of Ming's airships, but Zarkov has a surprise for them, a "disappearing device" which makes the ship invisible. Nearly 30 years before the Romulans' "cloaking device", Dr. Zarkov has invented the identical thing, which is also known as a "transparency screen". When his airships fail to locate Zarkov's invisible rocketship, Ming executes one of the pilots and sends a patrol to Frigia in anticipation of the Earthmen heading there to mine Polarite. Our heroes set off for Frigia. Although it is dangerous, Dale is on board because (we learn for the first time [although none of these talents is ever demonstrated]) she is a chemist, a radio operator, and one of Zarkov's "most valuable assistants".) Before they land, Zarkov sprays on everyone's face a "contra-freeze" solution to protect them from freezing. Although Polarite is easily spotted because the energy it generates causes snow to melt above the deposits, nevertheless, Zarkov gives Flash a "polarometer" to help him locate the deposits. Flash, Dale, Barin and a miner, roped together at the waist, set off to locate the mineral, while Zarkov and others set up a base camp for the miners near the rocketship. Scene after scene ensues of our heroes climbing, intercut with stock footage of icy peaks, falling rocks, blowing snow, and long shots of real mountain climbers, combined with a whistling whine on the soundtrack. Suddenly, Dale loses her footing and falls. Barin and the miner support the rope from which she dangles while Flash climbs down, maneuvers her onto his back, and climbs back up with her. Not even stopping to catch their breath, the party continues on. Overhead in one of Ming's airships, Captain Torch spots our heroes and bombs them, setting off an avalanche. This chapter's cliffhanger is scene after scene of stock avalanche footage, culminating in 4 dummies being swept off a cliff into a chasm. In his parked spaceship, Zarkov observes the avalanche on the ship's scope. Much, much stock footage of avalanches ensues. Luckily, Flash, Dale and the miner are OK, although Barin is injured. They have fallen into a chasm and have not been buried by the avalanche. Zarkov's ship takes off and tangles with Ming's ship, knocking out their radio and ray gun, so Captain Torch heads home. Zarkov flies over the site of the avalanche and spots the chasm. Simultaneously, Flash reaches Zarkov on the radio and Zarkov promises to rescue Flash's party. Much, much stock footage of a rescue party with magnesium lamps clambering down a mountain. Zarkov rescues Flash and friends and forces them to rest for 24 hours. Back at Ming's palace, Officer Torch reports he has destroyed Zarkov's expedition but was driven off by a second ship. However, Tecla, Ming's communication officer, intercepts a low frequency radio signal from Zarkov saying that everyone in the party is safe and they are just about to begin mining Polarite. Furious, Ming still spares the lives of Torch and his men, deciding to give them another chance to kill off everyone but bring Flash and Zarkov in alive. He has Torch instructed in how to remotely control his Annihilatons, robots who can be remotely exploded, literally "walking bombs", and sends them back to Frigia. At the mining site, enough Polarite ore has been mined so that Zarkov's ship is already being loaded when Ming's ship lands, discharging the 6 Annihilatons. When Flash spots them, he thinks they must be from another planet (! ), although he correctly deduces they are mechanical and operated remotely. When their rayguns have no effect upon the robots, several miners rush at them with shovels. Torch explodes one of the Annihilatons, making Flash realize they are walking bombs. The Annihilatons back Flash and his party against a rock wall, which they attempt to climb. Dale and a miner slip and fall, knocking themselves unconscious. Flash jumps down to defend them, and grapples with one of the mechanical men, as Torch remotely blows it up in this chapter's cliffhanger. The explosion throws Flash into a shallow pit in the ground, knocking him unconscious. One of the Annihilatons grabs the unconscious Dale and carries her back to Ming's ship. Another mechanical man grabs Zarkov when he comes to her rescue. When Flash comes to, Ronal tells him the Annihilatons got Dale and Zarkov. Reluctantly, Flash decides to carry the Polarite to Earth before rescuing his friends because theirs are only two lives while millions are dying on Earth from Ming's death dust. Flash contacts his father by radio and arranges to drop the Polarite atop Mount McKinley where it will attract all the death dust Ming has sent to Earth and neutralize it. Roka uses a large scoop to drop the Polarite out a chute in Zarkov's ship as Flash circles the mountain. Back on Mongo, Zarkov and Dale are brought before Ming, who demands Zarkov give him the formula for the contrafreeze solution and join Ming's campaign to conquer the universe. Zarkov refuses. Ming sends Torch back to Frigia to get Zarkov's ship and has Dale robed to be his bride (again - see the first FLASH GORDON serial). Torch in Ming's ship and Flash in Zarkov's ship reach Frigia simultaneously. Torch's ship shoots at Flash, who turns on a smoke screen and lands, to fool Torch into thinking the ship has been hit. Flash and Roka hide inside the ship and get the drop on Torch and his fellow soldier when they brave Frigia's cold to get to Zarkov's ship. They fly back to Ming's palace, with Flash and Roka disguised as Ming's soldiers who, luckily, wear helmets with visors so their faces are hidden. They overhear Zarkov is just about to be executed via a destroying ray. Flash jumps through the window of Ming's torture chamber where Zarkov has been manacled between two stone pillars. Using a sword, Flash tries to pry Zarkov free, but it is too late. The destroying ray, which looks like a large circular beam of sunlight, reaches Flash and Zarkov, whose clothes start to smoke from the heat of the ray in this chapter's cliffhanger. Roka jumps through the same window Flash had used to reach the torture chamber. Zarkov, with his last bit of consciousness, urges Roka to shoot a clock on the wall with his ray gun. This causes the destroying ray to cut out immediately, reviving Flash and Zarkov. Ming calls for his guards to shoot our heroes but Dale spoils their aim. Zarkov, still manacled, tells Roka and Flash to head for the caverns under the palace, while he bargains with Ming. Dale is escorted to a room where she meets an unnamed fellow prisoner from Arboria who agrees to give Dale the clothes she was captured in. These are very Maid Marian-ish togs complete with cape and a jaunty cap that has a long slender feather. Zarkov is brought to Ming's throne room and agrees to use his scientific genius to help Ming conquer the universe in return for his life. However, in Ming's lab, he meets fellow prisoner Karm who shares Zarkov's intention to use all his energies for breaking Ming's evil power. Flash and Roka jump two of Ming's guards and steal their uniforms (again), picking up a radiophone in the process. They meet up with a guard (who doesn't recognize them with their helmeted visors down) who has a release order to move Dale. They knock out the guard and rescue Dale, but unchivalrously leave behind the Arborian woman who gave Dale her clothes. Using the release order, Flash and Roka take Dale to Ming's lab where they are reunited with Zarkov. Zarkov, however, refuses to be rescued, explaining he and Karm can better counter Ming's offensive mechanism from the lab. Flash shows Zarkov the radiophone which Zarkov sets to a low frequency, promising to make his own radio so he and Flash can keep in contact. By the time Flash, Dale and Roka have made it to the caverns, Zarkov has completed assembling a radio! Just as Flash and Zarkov make contact via radio, an alarm is heard signalling the approach of enemy ships. This is Barin's "fleet" (although we see only two ships). Karm offers to give Zarkov a disguise he has long kept for himself, so Zarkov agrees to meet Flash and company in the space court (where the rocketships are parked). Wearing a hooded robe like a monk, Zarkov sails out of the lab under the nose of the unsuspecting guard! Captain Torch suspects Flash will try to steal the Ming ship in which he arrived at Ming's palace, and conceals a "fire chemical" in it. Flash and his party are challenged when they reach this ship, and a fight breaks out, during which the controls are accidentally thrown and the ship takes off with an unconscious Roka. It immediately catches fire due to Torch's "fire chemical", so Flash, Dale and Zarkov steal another of Ming's ships and set off to rescue Roka. Flash ties a rope to the inside of his ship, which Dale pilots so it is right above Roka's flaming ship. Flash climbs down the rope and forces his way in. At a signal from Flash, Zarkov unties the line. Roka is still unconscious, so Flash ties him securely to the rope and then lowers him to Zarkov in the ship which Dale has now maneuvered to be directly beneath. Zarkov hauls Roka in, and Flash clambers down the rope, as Roka revives and the burning ship explodes and plummets. Just then, Barin's two ships arrive and, not realizing Flash and company are in the Ming ship, they attack. The radio in Ming's ship is not working, so Zarkov is unable to contact Barin. Barin orders the use of the destructo ray and this chapter's cliffhanger ends with an explosion on Ming's ship. Although their ship is badly damaged and on fire, Flash and his friends are unharmed. Flash decides to transmit Morse code in the hopes Barin is on one of the attacking ships and will decipher it. Barin does get the message and arranges to magnetically grapple the two ships together, allowing Flash and his party to step out the hatch of their ship and directly into Barin's. Back at Ming's palace, Karm completes preparation for Ming's new superweapon, projectiles armed with zotranilium. In anticipation of a test in Arboria, Ming instructs Torch to send a secret communication to Lady Sonja, Aura's attendant. This arrives in the form of invisible ink on paper carried by a black bird, instructing Sonja to arrange for Aura's kidnapping. Under pretense of charity to the family of a poor woodcutter, Sonja lures Aura to the Red Forest, where Torch and some of Ming's men abduct her. Both sides ride armored horses with horns like unicorns. Back in Barin's lab, Zarkov queries Barin's scientist, Keedish, on the properties of zotranilium. Keedish explains this is known as the fire metal; when exposed to oxygen, it burns with the heat of the sun and cannot be extinguished. Quickly, Zarkov and friends start to work with the lab's thermo-electronic apparatus on a method to control and extinguish Ming's projectiles. Barin receives a radio message from Ming warning of the zotranilium attack; he thinks Ming is bluffing until he finds out, almost immediately, that Aura has been kidnapped as well. Back at Ming's palace, Ming intercepts a message revealing Zarkov has invented a defense against zotranilium. He sends Torch and Sonja back to Arboria to destroy Barin's radio station to prevent him broadcasting the location where the projectiles land, so that they won't be neutralized. Ming personally throws the switch to launch the first projectile. Flash and Dale, circling Arboria's barren wastes, spot it en route. Zarkov radios Flash the exact location. Flash dons a fire suit and Dale turns on the contra thermal waves which protect both the ship and Flash. The ship lands and Flash exits with Zarkov's device, which he plants near the projectile. Everything has gone well until Zarkov's machine suddenly fails due to being overloaded and burning out a connection. Flash falls into a pit as flames shoot up in this chapter's cliffhanger. Inside Zarkov's ship, Ronal fixes the fault in Zarkov's contra thermal machine, which powers up again. Flash climbs out of the pit and returns to the ship, where he picks up another device and, over Dale's protest, returns to the site of the projectile, where he plants it, putting out the flames. Returning to the ship again, Flash contacts Zarkov by radio and discovers two more projectiles have landed but before he can find out their location, Captain Torch drops a bomb which knocks out communications at Barin's castle. Barin's ships drive off Torch's ship, and Zarkov repairs the radio and tells Flash the coordinates of the remaining two Ming projectiles. Torch enters Barin's lab and tries to destroy the gun but Roka chases him off. Meantime, back at Ming's palace, Ming reveals to Aura that he has set a trap for Zarkov and Flash. En route to the Land of the Dead in Zarkov's rocketship, they encounter one of Ming's ships. Instead of fighting, however, Zarkov merely turns on his "disappearing screen" once again rendering the rocketship invisible. Ming orders Torch to arrive at the Land of the Dead first and plant a bomb which will detonate by the time Zarkov's ship arrives. Torch has his men dig a hole in which to hide this explosive device, which looks like a conga drum. Meantime, Sonja keeps watch from a nearby ledge but is captured by Rock Men. These are Hawaiian looking men who wear drab costumes and pointy headed masks that cover their entire face. When a giant lizard passes by, the Rock Men move quickly together and stand absolutely still, fooling the giant creature into thinking they are part of the rock face. They take Sonja to a nearby cave which looks suspiciously like the set of the Clay King's throneroom (from the second FLASH GORDON serial). They speak to each other but neither we nor Sonja can understand because their language is an audio tape played in reverse. The Rock Men capture Torch and his men soon after Torch has set the fuse. Zarkov's ship lands and everyone disembarks, except Barin and Ronal, to locate a cave in which to shelter until the poison gas dissipates. This chapter's cliffhanger is the attack by the Rock Men on our heroes just as Ming's buried explosive detonates. The explosion causes a rockslide, knocking Flash, Dale, Roka and Zarkov unconscious. The Rock People carry them a little distance away and one of them pounds on a rock, which releases a gas that revives our heroes. Luckily, Zarkov can understand and speak Rock talk, which he identifies as the language of an ancient Earth tribe that once inhabited the Gobi desert. Everyone is taken to the Rock King but, en route, two giant lizards fight. One of Ming's soldiers panics and runs for it, and is killed (off screen) by one of the giant lizards. In the Rock King's throneroom, the prisoners are jointly blamed for the disappearance of the Rock King's son. If he does not return, they will all pay with their lives. Flash, Roka and Zarkov are sent to a cell separate from Sonja and Dale. When Flash tries to protest, he is clubbed unconscious. Thinking Sonja is asleep, Dale takes out a short wave radio and contacts Karm, but he cuts her short because Ming is about to arrive. Sonja overhears and fights with Dale, getting the radio from her. The Rock Guards separate the two women, and Sonja, ever the trouble maker, contacts Karm, pretending to be Dale. As she hoped, Ming overhears and realizes Karm is a traitor and has him locked up. Roka pretends to be poisoned. When the Rock Guards investigate, he grapples with them as Flash and Zarkov escape from the caves, each grabbing a spear as they leave. They feel a strong gravity pull and notice one of the Rock Men, the King's lost son, trapped on the side of a cliff by a lodestone, the source of the magnetic attraction, which has been exposed by the explosion Torch set off. (The Rock King's son is identifiable because he has a sun pattern painted on his costume). Zarkov explains this part of Mongo is made up of highly magnetized particles (!!). Flash sends Zarkov back to the caves to inform the King his son has been found. Flash sets off to rescue the King's son, laboriously climbing up the cliff face against the extreme magnetic pull. Back in the caves, the prisoners are sentenced to death. One of Ming's soldiers is tossed into a fiery pit, as Dale screams and covers her eyes. Zarkov is delayed returning to the caves by another giant lizard, as the Rock Guards gather up Dale to lower her into the fiery pit in this chapter's cliffhanger. Flash manages to push a boulder off a cliff which smashes the lodestone, putting an end to its magnetic pull. He carries the son of the Rock King to safety. Roka tosses a rock at the guards manhandling Dale and runs off with her into the caves, but they are soon recaptured. Just as Dale is once again about to be executed, Zarkov arrives to announce the Rock King's son has been located, followed a beat or two later by Flash carrying the boy. The Rock King grants Flash and his friends their freedom, as Torch, Sonja and Thong take the opportunity to escape. Flash and Roka set off in pursuit. Torch's rocketship has been destroyed in the explosion so the Ming contingent decides to sneak up on Barin's ship. However, Sonja screams when she spots a giant lizard, and Barin hears her and sets off an alarm, alerting Flash and friends. They split up and corner Torch, Sonja and Thong, who toss a boulder down on them. A fight ensues and our heroes manage to overcome Torch and Thong and take them hostage along with Sonja. They all take off in Barin's rocketship and contact Karm. Although he is now shackled in prison, he has managed to get hold of his radio through the efforts of Captain Sudan, who is still loyal to Barin. Barin arranges for Sudan to open at midnight the gates which lead into the caverns beneath Ming's palace, so that he can rescue Princess Aura. Leaving Dale and Ronal to guard Torch, Thong and Sonja, Flash, Barin, Roka and Zarkov set off into the caverns which are clearly the same ones from the Rock People sequence. As they are creeping along a tunnel, a contingent of 4 of Ming's Palace guards come along; and a fight ensues, during which one of the guards manages to set off an alarm. Ming rushes to Captain Sudan to find out what is going on, and Sudan reluctantly turns on the spaceograph, showing Flash and company fighting in the caverns. Ming gloats that his enemies are trapped and orders Sudan to have the flood control valve turned on. Water comes pouring into the caverns and a panel comes down, cutting off the escape of Flash and friends. This chapter's cliffhanger is four stuntmen, dressed as Flash, Barin, Zarkov and Roka, being swept off their feet by the raging water. When Ming goes off to gloat about the death of Flash, Barin and the others, Captain Sudan diverts the water away from the bottomless pit (why would anyone build their palace on top of a bottomless pit?) and opens a panel to a side tunnel, allowing our heroes to escape back to Barin's rocketship. Ming summons Karm and Aura to his throneroom to announce the death of Flash, Barin and company. Karm reacts by trying to strangle Ming; Ming stabs him to death (off screen). Back in Arboria, Thong has escaped (off screen). In her prison cell, Sonja pretends to hang herself. When one of Barin's guards comes to her rescue, she kills him with a raygun (very careless with prisoners, the Arborian guards), and she releases Torch from his cell. Torch and Sonja attack Barin's radio room, knocking out the operator. Torch contacts Ming who tells him to recall Barin's ships so Ming's gas bombers can get through. After Torch sends out a general message recalling Barin's ships, he wrecks the communications equipment so his order can't be countermanded. Dale and Roka discover Sonja and Torch have escaped. Dale spies Sonja in the radio room and the two women fight. When Flash arrives, Torch threatens Dale with a gun. He and Sonja dash away with Dale their prisoner. The gates around Barin's castle are lowered, trapping Torch and Sonja, so they head for a tower with Dale, as Ming's ships arrive. Amid dropping gas bombs, Flash climbs to the tower roof and grapples with Torch, as once again Dale and Sonja fight. The girls pass out from the gas bombs, as Torch and Flash fall over the side of the tower in this chapter's cliffhanger. Flash and Torch fall into a moat; Torch appears unconscious and Flash rescues him. Barin, Zarkov and Roka rush to the laboratory to open the gas control valve. One of Ming's bombers lands and, led by Thong, Ming's soldiers kidnap the unconscious Ronal, Dale and Sonja and carry them back to their rocket ship, where they are revived. In Barin's radio room, Ming's gas has been dissipated from Barin's castle and the radio is once again operational. Barin orders his ships to use their destructo rays on Ming's ship. They manage to down two of Ming's ships, but the one carrying Dale and Ronal escapes. Back in Ming's throne room, Ming greets Thong and Sonja. He is angry over the loss of 2 ships and crews and their failure to return Torch, but Sonja points out a hostage exchange can be arranged for Dale. Ming contacts Barin's castle via the televisor and offers both Dale and Ronal in exchange for Torch. (Amazingly, no one bargains for Princess Aura, as well, prisoner of her father since Chapter 6.) Ming allows Zarkov to set the place of exchange in order to assuage Flash's suspicions that there may be some trick involved. Zarkov arranges for Ming's rocket to meet Barin's rocket at some neutral ground and the prisoners are exchanged, but Dale faints as soon as she reaches Flash, and Zarkov confirms she has been drugged. Ronal has been given a scroll from Ming, demanding the return of Dale accompanied by Zarkov for administration of an antidote or else she will die. Zarkov drops Ronal and Flash back at Barin's and returns to Ming's palace where Ming revives Dale. Dale is sent to the room where Aura is being held captive. Ming warns them the rug on the floor has been electrified with 4,000 volts and will electrocute anyone who touches it. Doubting him, they toss a piece of metal from a nearby suit of armor and when it comes into contact with the rug, it causes a small explosion. Zarkov is left in Ming's laboratory with Drulk, who tells him Karm is dead but passed along all Ming's secrets before Ming killed him. Zarkov and Drulk plot to rescue Aura and Dale and escape from Ming. Expecting a surprise raid by Flash and his friends, Ming orders Captain Sudan to double the sentries and particularly to put guards at the entrance to the abandoned tunnel. When Flash, Barin and Roka land nearby, they grapple with these guards before discovering they are loyal to Barin. Once again, Roka exchanges clothes with one of the guards (I wonder how the guard explained running around Ming's palace in this Robin Hood outfit?) and pretends to be escorting Flash and Barin as prisoners, although they encounter none of Ming's doubled sentries. They make their way to the room where Dale and Aura are locked up. Suspecting a trap, Flash borrows Barin's sword. Dale awakes and tries to warn Flash not to step on the electrified rug, but this chapter's cliffhanger is the explosion just as Flash approaches the rug. Flash is stunned but unhurt, Barin's sword having taken the brunt of the electrical discharge. Aura calls to Barin to turn off the controls, disabling the electrified rug, and our heroes make their escape. Back in Ming's throne room, Ming gets the report of the successful rescue of Dale and Aura. Ming orders the guard doubled on the laboratory, rightly thinking Flash will next try to rescue Zarkov. Flash, Roka and Barin scuffle with the guards outside Ming's lab, overcoming them, but someone sets off an alarm. Zarkov rigs the lab door so it will take hours to open, while Flash dons the uniform of one of the unconscious guards. Zarkov explains that, through Karm passing along the information to Drulk, he now knows the secret of Ming's power is thallinium, a new element which is a beam of light from the sun "where all light and power originate". After 30 chapters over 3 serials, Ming suddenly wakes up to the notion that it might not have been so smart to give Zarkov free reign in his laboratory. He contacts Zarkov via televisor and, in a megalomaniacal rant, similar to the last chapter of the MARS serial, Ming declares himself the "universe" and gives Zarkov one hour to surrender, claiming to have another source of power Zarkov knows nothing of. Flash and Roka, disguised as guards, exit the lab through a secret passage to the caverns. While Roka keeps watch, Flash spies on Ming, overhearing him cross examine Torch about his Z-O ship, which is loaded with solarite, meant to destroy all the cities of Earth. Flash and Roka return to the lab as Ming again contacts Zarkov via televisor, threatening to use the solarite against Earth if Zarkov doesn't surrender. Zarkov asks for time to consider, and Ming allows him 5 minutes. Flash confirms that Ming has solarite but says he will double cross them and attack Earth whether they give up or not. Drulk volunteers to stay behind, even though it will mean certain death when Flash crashes the solarite ship into the palace. Someone has to stay behind in order to control the death ray that guards the space court (never a problem previously when Flash has had to steal a Ming ship). Even Dale and Aura wear the Palace Guard helmets with visors as they escape through the secret passage, although they are not wearing uniforms, so this disguise would be unlikely to fool anyone. Dale, Aura, Roka and Barin go to Zarkov's rocketship. Barin announces he will "warm up the motor" while awaiting Zarkov. Zarkov and Flash approach the space court and spot a ship thoughtfully labeled Z-O. Some unsuspecting Ming guards approach and are disintegrated by the death ray, reminding Zarkov to radio Drulk to have it turned off. Flash makes it to the solarite ship where he signals to Zarkov, who heads to his own rocketship. Flash searches the Z-0 ship and locates a parachute. Zarkov's ship takes off, just as Ming learns that Zarkov and company have escaped from the lab. Realizing that Flash will use the solarite against him, now that his friends are safely away from the palace, Ming and Torch head to the tower room in the hopes of using the auxiliary controls to shoot the solarite ship out of the sky. Once there, Torch tries to contact Captain Sudan to connect the control to the tower room, but Sudan not only refuses but also locks the door of the tower room, trapping Ming and his minions inside. Zarkov radios Flash, who changes course for the tower and dons the parachute. Sudan confides to another guard (presumably loyal to Barin as well) that there is a way of escaping the tower, despite the locked door, but he is sure Ming will be so terrified, he will not think of it. (This is surely a loophole for Ming to re-appear in case there might have been a fourth FLASH GORDON serial. In fact, Ming is well and truly killed off in the second serial, where he is disintegrated, but such is the contempt the writers had for their audience, no explanation is ever offered of how Ming turns up undisintegrated in this third serial). Flash radios Zarkov he is about to parachute. Dale maneuvers the ship under the solarite ship and Zarkov and Roka help Flash into Zarkov' ship. Ming spots the solarite-laden ship heading directly at the tower; when he tries to leave the room, he finds the door locked. The ship impacts explosively on the tower, destroying it completely. On Zarkov's ship, everyone congratulates Flash for saving Arboria and the Earth. In some of the most wooden dialogue of all 3 serials, Flash intones, "In his mad ambition, Ming declared he was the universe." In order to justify the title of this third serial, Zarkov jocularly rejoins that he will radio Flash's father, declaring FLASH GORDON CONQUERS THE UNIVERSE! If you enjoyed reading my synopses/opinions of this FLASH GORDON serial, I recently have collected some of the reviews I wrote for CINEFANTASTIQUE under the title TIME CAPSULE, and these are now available in book form. Click here for details.